Hard cost = $200. Soft cost = fighting your way through Ikea to buy it. I’ve been using a “Standing Desk” for about 5 years now. The reason why I tried it in the first place was I was starting to get back pain for the first time in my life, and a colleague recommended it to me as a solution. My office at the time had fancy desks whose surfaces could be raised and lowered at will with a little internal motor, so I tried it out and have not gone back to sitting since. In addition to no more back pain, I find it easier to maintain the proper ergonomic technique on the keyboard & mouse. I find being able to move around when I’m on conference calls keeps my energy up. I also don’t get fat. If I sat all day I would probably be fat now. 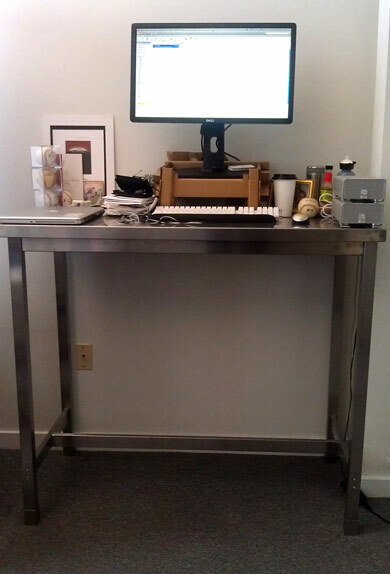 “Real” standing desks like the one I started with are really expensive, like $2k and up. I found mine (pictured here) at Ikea for $200. It’s technically a “bar table” but who cares. It’s the right height and is actually made of metal, not their usual particle board BS. It should last a really long time. There’s also enough room underneath to install a very nice fish tank or a hamster cage. Having a place to sit down is important too, especially when clients come by for a chat. Today my office has a conference room for that, but alternately you can put a small round table with 2 or 3 chairs near your desk and use that for meetings. It also keeps your work clutter separate from your “meeting space” to keep it more tidy and inviting. Next step is to figure out how to easily create a trap door to have at the meeting table for those moments when a quick escape is necessary.